How interesting that Moravia’s Contempt, and Tolstoy’s Anna Karenina should begin with the concept of happiness. It is a place to start, to be sure, for a novel about marriage. But, how often is it the place to end? Riccardo Molteni’s marriage to Emilia quickly falters within the first few pages of the novel. A script writer without much money, he is determined to provide a home for her; perhaps unwisely he rents a flat which he cannot afford, causing him to associate with film producers and directors for work when he would prefer to write for the theater. Emilia’s enthusiasm for her home depicts the only joy we see from her in the entire novel. Before it is even furnished, she unreservedly displays her affection for her husband on the dusty floor. But, is she loving her husband or what he has provided? The kiss over, in a very low voice that was like an inarticulate breath and yet was melodious, melting, she murmured in my ear–or at least so it seemed to me–that I should take her; and meanwhile, with all the weight of her body, she was pulling me down towards the floor. We made love on the floor, on the dusty tiles, under the sill of the window I had meant to open. Yet in the ardor of that embrace, so unrestrained and so unusual, I was conscious not only of the love she felt for me at that time, but more particularly of the outpouring of her repressed passion for a home, which in her expressed itself quite naturally through the channel of unforeseen sensuality. In that embrace, in fact, consummated on that dirty floor, in the chilly gloom of the empty flat, she was giving herself, so I felt to the giver of the home, not the husband. How surprised he is when not long after, she takes the pillow from their bed to the divan in the living room where she wants to sleep alone. Emilia contends that she cannot sleep with the early morning light coming in through opened shutters, with his snoring, with him next to her in bed. No matter what compromise he is willing to make, she insists on this new arrangement. And then comes fully half of the book which involves Molteni obsessing about his wife not loving him any more. We do not know why she doesn’t love him any longer, but frankly, I didn’t find much affection for him either. He seemed paranoid and weak, whining endlessly about her not loving him as she once did, and therefore he could not love his job. But, Riccardo does not readily get an explanation from Emilia. Nor does he give up his job. Instead, he puts up with Emilia’s indifference just as he succumbs to the will of Battista, a film producer who invites Riccardo, Emilia and Rheingold, a German director, to his villa in Capri. Battista is a large, loud, dominating man who manipulates situations to get what he wants, which happens to include the affections of Emilia. Battista and Rheingold plan to make a film of The Odyssey, particularly the story of Ulysses and Penelope. Battista feels that it should be an adventure film; Rheingold wants it to take on a psychological perspective. Moravia draws an apt parallel between Ulysses and Penelope, and Riccardo and Emilia, through Rheingold’s point of view. “Penelope, being proud and dignified, in the antique manner, would like to refuse their (the suitors) presents, would, above all things, like her husband to turn the suitors out. But Ulysses, for some reason that we don’t know, but that we shall easily find, does not wish to offend the suitors. It is a parallel story in many ways, but Riccardo does not destroy Emilia’s love by his prudence. I think instead that he destroys it by his timidity. Neither of them are willing to speak to each other in a straightforward way; neither of them tells the other what he is really feeling. Our relationship had never been clarified right down to the bare truth, it had always been carried on by means of allusions. Their situation rises to an enormous misunderstanding, in which the only way Riccardo’s anxiety is even slightly appeased is through his dreams of how he wants it to be. Twice Emilia comes to him as his wife; the first to be kissed on the beach where she is sunbathing, the second when she seems to be sitting in the same boat he is rowing the afternoon she has promised to leave him. …thought is always more fallible, even in its apparent preciseness, than obscure, confused feeling. But I loved her, and love has a great capacity not only for illusion but also for forgetfulness. An uncertain evil causes anxiety because, at the bottom of one’s heart, one goes on hoping till the last moment that it may not be true: a certain evil, on the other hand, instills, for a time, a kind of dreary tranquility. I read this novel with Frances and Richard who hosted it, as well as Ally, Grant, Scott, and Scott G. F. Bailey. Don’t for a minute imagine that I am not cynical, dear Frances. I am filled with cynical attitudes about weak men who don’t hold up to their end of a marriage, just as I am about the idea of marriage being based on love and hope as if they were flowers and kisses. It takes much more than hope, or ignoring, or pouting, to keep a marriage together as anyone over twenty knows. I am not, however, qualified to write a treatise on marriage. I simply will think about what Moravia had to say about this young couple, and how deeply they failed one another. Also, I am now consumed with the title Contempt. It applies to so much! To marriage. To writers. To young beauties. To egotistical men who think they are above it all. Really, what a brilliant title, and I didn’t even mention that in my post. I really enjoyed your review of this one, Bellezza. In some senses, the story sounds quite thoughtful and layered almost as though you have to look far beyond the words on the page to decipher the true nature of this couple’s relationship. Would that be a fair assumption? One for my wishlist, I think. It’s a story with complicated characters, so true that they have many layers to them. In some places, this book made me think of a mystery as I tried to solve their motivations, or the reasons behind their words. I have never read Moravia before, not sure that I want to read more of him right now, but I’m glad I read this one. All in one day over Memorial Day weekend here in the States! I haven’t posted my review yet, but, having never read Moravia before, I was impressed by this. It seems to me the moment Riccardo sacrifices his dreams for Emilia the relationship founders as he can then blame her for them not being fulfilled. I’m looking forward to your review, Grant, as I felt we had similar feelings on a tweet or two. This is the first time I’ve read Moravia as well, and as I read it all in one day I was simultaneously absorbed and overcome. There was so much heavy emotion, and so much to sort out regarding the characters’ motives/personalities. I knew that I didn’t like Riccardo very much, but Frances’ review helped point out how egotistical he was. I was thinking more along the lines of selfish, but also so terribly wounded. And the communication between he and Emilia was horrendous! Did they ever share one true thought? They were so evasive. There was much to think about. I completely agree that once he sacrificed his dream of being a writer for the theater, for Emilia’s dream of a home, he became resentful. They never quite recovered, and I wonder if they would have, had she lived. Do you think they had a chance? Thanks for reading along with us, Bellezza. I had meant to include a reference to that quote about love’s capacity for illusion and forgetfulness, but I forgot about it when I was writing my post! Glad you mentioned it here. Also glad you mentioned the quote about the poisonous ambiguity persisting even after Emilia’s death. I think both of these quotes hint at the notion that in some sense the idea of Emilia was more important to Molteni than Emilia herself–or at least it was until it was too late for him to do anything about it. Another painful thing to consider is that divorce wasn’t legalized in Italy until the 1970s if I recall correctly. Emilia’s exit, in a sense, was one of the few ways for her to escape out of the prison of being married to Molteni. But there it was: I had not married a woman who could understand and share my ideas, tastes and ambitions; instead I had married,moor her beauty, an uncultivated, simple typist, full, it seemed to me,mif all the prejudices and ambitions of the class from which she came. I point to this now because it highlights the arrogance of Riccardo, which wasn’t readily apparent to me. Weakness, yes. Powerlessness, yes. Surely it is a “good” ending in the sense that Emilia did in fact escape. However, “the poisonous ambiguity” after a marriage ends will always remain the most piercing phrase with me. It’s so dreadful to have a spouse die, and be left with all the what if’s, such as happened in my own life twenty years ago. I am too often reviewing every perceived wrong on both of our parts. I want to see the movie, too; I’m always intrigued by Brigitte Bardot! I can only imagine how she would play Emilia, and I’d like to compare the novel with the film. 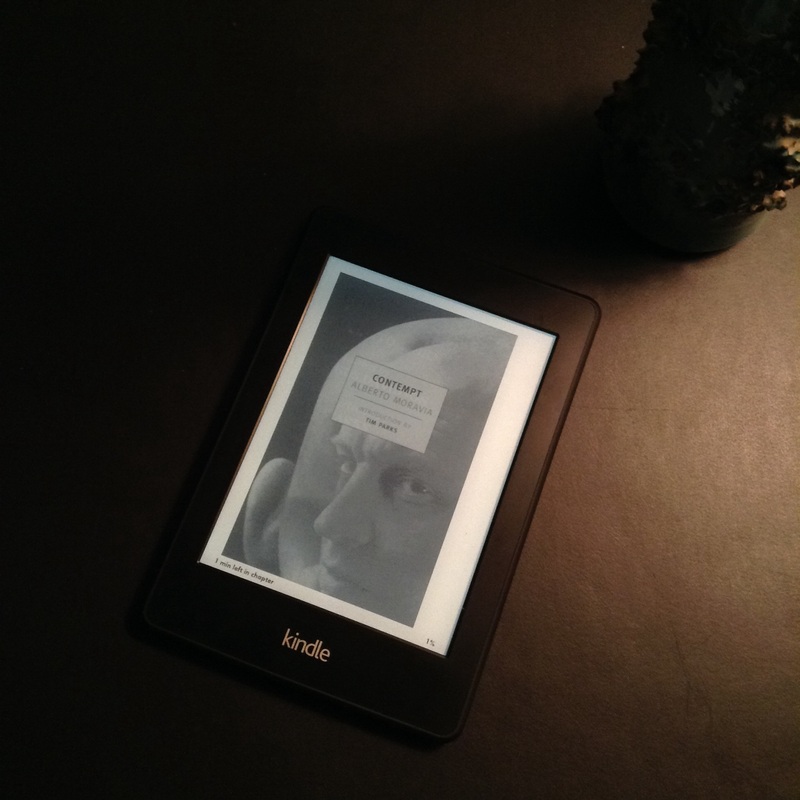 There will be another read-along of Alberto Moravia during July3-5 this summer. This time the book is Boredom. I hope you feel like reading that together with Frances, Richard and I. Also, the Japanese Literature Challenge 9 begins today (I’ve a post prepared to publish), and I will be reading Naomi by Tanizaki with TJ of My Book Strings. We’ll post at the end of June, but please feel free to read that with us as well. I agree that it’s largely Riccardo’s timidity that destroys the marriage, and that despite his seeking some core explanation, some originating event, he abjectly and almost comically can’t grasp his situation, responding, when Emelia finally tells him “I despise you!” that for the first time he sensed that he might not know himself. I had not thought much about Emelia’s part in it, largely because she seems to me so trapped by her circumstances. In a way she presents Riccardo with the same problem Bartleby presents to his employer: a refusal to conform to expectations, to be treated as less than human. And like Bartleby’s employer, Riccardo is adrift in his own attempts to rationalize that lack of response. Anyway, I’m glad to have participated in the group read with you – quite a fascinating and enlightening set of responses! He really doesn’t understand why Emilia bursts forth with, “I despise you!” It’s like he thinks she’s taken leave of her senses, for surely the problem couldn’t lie with him! He’s really very ignorant about what it means to be a good husband; I’m glad that Moravia made him so young as, for me, that helps explain some of the errors in his thinking. The more I think about it, the more i see Emilia as a victim: in her poverty as a child, in her marriage, and even in her death. What did she control? Nothing! I, too, am glad for the opportunity to read this with all of you. Moravia is an author I’ve not read before, and I’m looking forward to Boredom this July. But, even if only a few of us can participate in that, I’m so glad we could discuss Contempt. Your comments always add to my appreciation of the text. Bellezza – I too am grateful to have been able to read this with the group, and found the diversity of responses particularly rewarding. The humor in Contempt is nearly impossible to divorce from its seriousness, its “uncomfortable” atmosphere, which is partly what made the novel really stand out for me. It’s rare to find a writer who can maintain that edge for 200+ pages, where you quite focus on that hazy space between tragedy and comedy. And then it’s not even hazy in Moravia, whose writing is so clean and sharp and cold. I think it’s clear that Emelia’s options are limited, and that for her “home” is a kind of prison, not the rosy answer to some female longing that her husband invents for her. I found the red grotto scene strangely moving: as oblivious as Riccardo is, I agree with you – how can one not pity him a bit? His loss is real, as is the destruction in his wake.